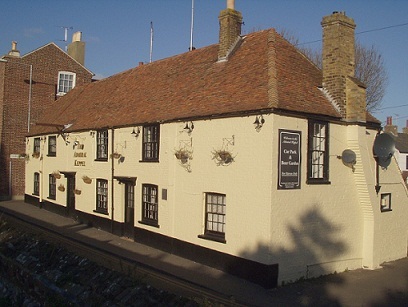 This building is reputed to be one of the oldest public houses in Deal. It used to be surrounded by its own orchards with an adjoining farm. It is believed to have been re-named in 1779 after Admiral Keppel was acquitted by a court martial. In 1778 he had been promoted to Admiral of the Blue and was Commander of the Channel Fleet. He had visited this particular pub with other naval officers when his career was at a low ebb, having inadvertently let the French escape! Deal in those days had a large naval base with many ships anchored in the Downs. It is rumoured but by no means certain that The Admiral Keppel used to be called ‘The Farrier’. It was at least two hundred years old before the re-naming. In 1662 there was a licencee named Finegan Waltham who purchased a sign by that name for 6s 8d. This would be about 30 pence today (not allowing for inflation!). From about 1725 to 1804 the Goodson family kept this pub. In 1824 to 1828 a James Hall Powell was the licencee. In 1843 to 1847 John Hoile was the owner and James Ferrier a tenant. In 1850 it was owned by Hill & Sons, brewers. The tenant then was J Marsh. Mrs Susanna Verrier Marsh was the licencee from 1878 to at least 1899. In 1903 it passed into the hands of Thompson & Sons, well known brewers of Walmer. At that time Emily May was the licencee and the gross value of the property was £1300. Today it is owned by Punch Taverns plc. For information concerning the life and career of Admiral Keppel himself see Ruddock Mackay. Keppel, Augustus, Viscount Keppel (1725–1786). Oxford Dictionary of National Biography. Oxford University Press, 2004; online edn, Jan 2010, accessed 1 Nov 2010.